Hello! Thank you for your past advice in caring for my Brown Ghost Knifefish (Apteronotus leptorhynchus), that has been immensely helpful! Knifefish (A. albifrons) but he never uses it. I got the "Large" size so it's plenty big enough for him. At first I thought he didn't like it because it is clear but I read that this doesn't make a difference because their electrical senses tell them that they are in an enclosed space. The tube is near his favored hiding place. I wonder, is this maybe a difference between A. albifrons and A. leptorhynchus? Or could it be that the tube is just a little too big for his current size? Besides the tube there are several possible hiding places in amongst the driftwood and rocks but he consistently chooses a very tightly fitting space. An interesting behavioral note: The Brown Ghost has only been in his permanent home for about 6 weeks (after 4 weeks of quarantine) and he is still very very shy. I have never seen him out and about during the daytime and even at night he seems to mainly stay in hiding. But at night, if I come to the tank and look at him he will venture towards me partway out of hiding. Maybe he is anticipating being fed? The other fish in the tank get fed during the day of course, but feeding time for him is always about an hour after lights out. Ok, question about a different fish now. A few weeks ago I saw a Peter's elephantnose fish in the local petstore, he had been an owner surrender. The poor thing was miserable in a small tank with many other fish, and he had a damaged "trunk" so of course I took him home with me. Either he got bitten or else damaged against a rock or something, but most of his trunk is gone now. He seems to be settling in but I am wondering how good his chances are without his trunk? Will he be able to find food effectively without it? He also stays in hiding most of the time which is understandable given the trauma he has been through. The injury seems to be healing up cleanly with no signs of fungus or infection. Please understand, I would have still bought him even if I knew his chances were not good as he is at least a bit more comfortable now (i.e., not in a very small tank with too many other fish and no good place to hide). But I do hope he will be able to adapt and get better. What is your opinion on his chances? Thank you for being such a great resource, especially for those of us who love the more unusual fish! I've had my little guy (or girl, as the case may be) for about 10 weeks now and is doing well. He has gained weight and I believe he has grown longer as well. At least, he is having a harder time fitting into his favorite daytime hiding place. There is always a bit of his tail sticking out, LOL. I got one of those clear acrylic tubes that they sell for Ghost Knifefish (A. albifrons) but he never uses it. I got the "Large" size so it's plenty big enough for him. At first I thought he didn't like it because it is clear but I read that this doesn't make a difference because their electrical senses tell them that they are in an enclosed space. The tube is near his favored hiding place. I wonder, is this maybe a difference between A. albifrons and A. leptorhynchus? An interesting behavioral note: The Brown Ghost has only been in his permanent home for about 6 weeks (after 4 weeks of quarantine) and he is still very very shy. I have never seen him out and about during the daytime and even at night he seems to mainly stay in hiding. But at night, if I come to the tank and look at him he will venture towards me partway out of hiding. Maybe he is anticipating being fed? The other fish in the tank get fed during the day of course, but feeding time for him is always about an hour after lights out. He also stays in hiding most of the time which is understandable given the trauma he has been through. The injury seems to be healing up cleanly with no signs of fungus or infection. Please understand, I would have still bought him even if I knew his chances were not good as he is at least a bit more comfortable now (i.e., not in a very small tank with too many other fish and no good place to hide). But I do hope he will be able to adapt and get better. What is your opinion on his chances? Hello! Since I have bombarded you guys with questions about my Brown ghost knife the past few months, I thought I'd give you a quick update. He was in a different hiding place this morning so I was able to get a good look at him. Wow! He has definitely grown longer over the past two months and has actually gotten a bit plump. I guess that means he has adjusted to his new life and is doing well. <Certainly does. 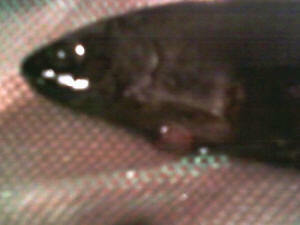 But the trick with Apteronotus is to keep aquarium size and filtration scaling upwards as the fish grows. Recall that volume is a cube of length. So if a fish doubles in length, it will actually be 8 times bigger in terms of bulk. For sure it probably doesn't require exactly eight times as much space or filtration, but it will certainly need a lot more space. Problems with Apteronotus usually happen when people get complacent. He was in the hollow log shelter and facing the front of the tank. When I would look at him, he would swim forward a little, then back up. If I was out of his view, he seemed to just stay still so I'm pretty sure he was reacting to being observed, maybe hoping for some food to follow. So I'm going to do a little experiment with some target feeding to see if he will become a little more outgoing. You know, the way you would with a shy dog or cat... throw a little treat into their "comfort zone", once the treat is eaten throw another treat just a little closer to you, etc etc until they are comfortable coming up to you for the treat. Betcha this will work! Oh yes, I keep saying "he" but I'm starting to think it is a female due to the length and shape of the face. I'm not sure how big they need to be for this to be accurate though. What do you think? At a guess, my fish is about 6 or 7 inches long right now. Hello! First of all, thank you so much for the information you have provided me for caring for my Brown Ghost knife fish (Apteronotus leptorhynchus). It has been invaluable! Of course I still have questions though (smile). There's quite a lot of info regarding the larger A. albifrons, not as much about A. leptorhynchus. I'm sure most of the information applies equally to the Brown Ghost but there is quite a size difference between the two. Are the feeding guidelines for the Brown Ghost pretty much the same? Are live ghost shrimp an acceptable food? 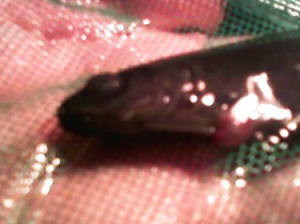 I've been giving my fish live blackworms, frozen bloodworms, and various frozen (meaty) foods. It would be nice to keep some ghost shrimp in there as an occasional snack. And if the shrimp are a bit large for eating directly, well, they will have babies that can be eaten - at least that is my way of thinking about it. also floating plants galore. Tankmates are 5 marble Hatchetfish, 5 lemon tetras, and 7 neon tetras. I'd like to add a pair of Starlight Plecos (L183 Ancistrus dolichopterus) - would these be ok or would a group of Otocinclus be a better choice? There are no catfish or loaches in the tank, no other nocturnal fish to compete with the Brown Ghost at feeding time. I understand that Brown Ghost knife fish like to stay near the bottom of the tank so it seems that the top and mid water fish keep out of his space. But I wasn't sure about the Plecos, especially since this species also likes to eat meaty foods. For water circulation, there is a hob Aquaclear 50 filter and a powerhead. The powerhead is located fairly low in the back corner of the tank, angled pointing up and toward the front to create a circular type flow. I'm not sure the gph for the powerhead but it is one I used to use for a nano reef tank and it really moves the water in a 40 gallon tank. Temperature is set to 76 F. I'm in the process of converting the tank to blackwater as it is the natural habitat of the fish in this tank. My Brown Ghost is currently approximately 6 inches long. So far I have not personally witnessed him feeding but his body weight seems good and I believe he is a little plumper than when he first came in. He is still very very shy and of course moving to his new tank is another adjustment he must go through. I've seen YouTube videos of Brown Ghost knife fish that were pretty outgoing, swimming around in the open, etc. but have no idea how long it took to get to that point. Do these fish generally become more outgoing as they settle in? Anything else I can do to help him feel more comfortable? Thanks for the advice. I'll leave out the shells as the regular water changes should do the trick. The key should be fairly little but often to keep the water parameters steady. Hello all! As always, thank you so much for your help and support! Got a question today for you. After doing my research, I recently purchased a Brown ghost knife fish (Apteronotus leptorhynchus). He is still in quarantine tank and will be there until I finish completing his permanent (and much larger) home. From the information I was able to find about these (most of it from your website - thanks!) it seems these fish are quite prone to skin fungus. <Sort of. Apteronotus Knifefish generally are sensitive across the board. Judging by their native habitat, they need to be kept in blackwater and/or soft water for optimum health. I believe keeping brown ghost knife fish in these conditions will help prevent fungal problems. My question is, which do you think more important - having blackwater, or having soft water? Ideally both, but soft acidic conditions can be unstable and stability is also very important for these guys. It would seem logical that that tannins in blackwater would have an important protective effect for their skin. So, I was thinking about setting up the tank with blackwater but including a few seashells or pieces of limestone to prevent the water from becoming too soft. Hopefully this would give the benefits of blackwater without the instability that can come with very soft and acidic water. According to my county's website, the water hardness of our finished water "averages 64 milligrams per liter, or about 4 grains per gallon." Hi. I recently rescued a brown ghost knife from deplorable conditions. She had her tail eaten off, her fin was fringed, and she was covered in ick. The people who had her had her in a ten gallon tank with two black ghost knives that were way bigger and relentlessly attacking her. I brought her home and I put her into a five gallon plastic portable aquarium and proceeded to change the water constantly for the next few days. By about a day and a half in she was showing no signs of ick anymore. And she was pretty active. I moved her into a ten gallon ( she is tiny by the way, not even three inches) with a few caves and plants and lots of bubbles cus she seems to really like them. And she is doing really good. She no longer looks emaciated and her color is great. She eats like a champ. So all that is great. I guess my question is how can I make her more comfortable? She never comes out of her cave. Do you think some small innocuous dither fish would help her feel more safe? Yes this set up is only temporary while I nurse her to full health so I can keep an eye on her. Yes I know that these guys are nocturnal, I keep a black ghost knife and while they are very similar they are also very different. She pokes her head out when I talk to her and does her knife wiggle that they do. And I see her occasionally zipping around the tank at night when there is nobody in the room and the lights are off. But If she notices anyone is even watching she is gone lol. I just want to make her as comfortable as possible. Thanks you for your feedback. And she was pretty active. I moved her into a ten gallon (she is tiny by the way, not even three inches) with a few caves and plants and lots of bubbles cus she seems to really like them. And she is doing really good. She no longer looks emaciated and her color is great. She eats like a champ. So all that is great. I guess my question is how can I make her more comfortable? <S/he is nocturnal, so some degree of reticence is normal, especially given prior experiences. Plus, Brown Ghosts aren't as "upwardly mobile" as Black Ghosts, and tend to be shyer and less ready to swim to the top of the tank. <Conceivably, but I wouldn't put any money on it, at least, not without floating plants or some other way of dimming the overhead light. Thank you so much for your reply. I have the entire tank covered with water lettuce and the only light is a dim blue led bubbler cus I wanted her to be more comfortable before I put anymore light in. So those things are already done. The filtration is way over what is called for. I have a hob rated for a 20 and a sponge filter on it as well with a power head attached. She ( I say she because her features seem to be less elongated which is a characteristic of the females) loves to swim around in front of it when she comes out. As long as shyness is just in there nature I will just continue to care for her and make friends with her till she is a bit bigger and a bit less afraid maybe. So it may sound funny but I do worry about my fish being lonely. And when she is moved to her permanent tank after I'm done getting her all healthy she will be the only fish in a 75g. If I wanted to get some innocuous little companions to keep her some company what would you recommend? <See above. A lot depends on the size of your specimen. Pretty much any surface-swimming tetra, barb or Danio that won't be eaten should work. Bleeding Heart Tetras for example, or Congo Tetras. Giant Danios might be another option, but these fish veer towards hyperactivity, and need space. (before putting them in I ran the tank for about two weeks to ensure healthy bacteria). The plecostomus just died a few days ago -- sad -- and now my brown fish seems to be on that track unless we can save him. When I first put him in the tank, he was very shy and would simply hid in his castle with his cichlid friend (who is significantly smaller than him -- a purposeful decision to ensure they behave nicely together). Now, he has a white, chunky, blotchy film all over him, and glazed-over eyes; he also swims in the open, often suspending himself vertically and putting his face down into the tank's bubble stream, or he'll lay on the bottom floor, then dart up real fast to the top and either let out a huge bubble or gasp for air (i can't tell which one). His fins are also looking frayed and white-ish at the tips; I've noticed the cichlid will now go and softly nibble on the white film of the brown knife's body, which sends the brown knife scurrying away rapidly (I'm not sure if the cichlid is trying to actually eat/attack the brown knife or just nibble on the film). in addition to Tetra 'AquaSafe' tapwater conditioner. Here's the tank stat's as of an hour ago: pH (8.4); Alkalinity (300); Hardness (150); Nitrite (0); Nitrate (20). The tank's temp is steadily 75 degrees, and the brown knife is still eating. I was looking for the African's behavior, mine is <has> been shy thanks to the kids I use<d> to baby sit, but that is not the problem. Today he starts swimming like crazy and bumping with the plants and tank walls. When he stop he is gulping air and he is not eating nothing today. I have no clue what's wrong with him I need help. I am not an expert caring for fish tanks. Help please. also I'll be getting a hundred gallon tank bottomed coffee table for Christmas so by the time they grow they will have room for expansion. When I first started this 55 up I let it set its cycle for 3 weeks, and then tested my chemicals and on my home test everything seemed fine and tank temperature was 79. So I took a water sample to the store and had it tested nitrates and nitrites were almost zero, ammonia levels were zero, and ph was a solid 6.9. So that day I bought the 2 Danios and took them home to be the first fish in my 55. Since at this time I had the Blue Snail, Glofish, Cory, and Loach (inch long when I got him) and Bircher (2 inches when I got him) in my 30 gallon, I used the 55 to quarantine the Danios. After a little over another 2 weeks the Danios were doing wonderful and happy, so I added a live banana plant and a small amount of moss around the dish it sits in. The bottom of my 55 is sand and I also have 2 4 inch bubble stones a "bank tube" (like you send money in up the tubes in the drive through lol) for them to hide in and a slice of a huge conk shell for them to play in also. I let these newly added amenities cycle with the Danios for a week they were fine and healthy so I changed the carbon in my filter and let it cycle another 2 weeks. Tested my water levels and everything checked out the same so I bagged and started to temp the fish from the 30 gallon, got them all added and everyone was happy and healthy. after a few more weeks I found a wonderful 5 inch long baby brown knife and I just had to have this fish! Brought him home and set him up in the 30 gallon (which I had vacuumed water changed and started recycling about 2 weeks before this purchase) I started quarantining him and he seemed to be doing well until about a week later when he started flashing on the giant open fake clam shell I gave him to hide in, and he started rubbing himself all over the fake plant. At first (since I've never had to deal with Ick before) I thought it had to be water related so I checked his water levels and ammonia was zero nitrates and nitrites showed very very low with my watercolor test and the Ph was still an awesome 6.9, water temperature was 80. I researched his symptoms and talked to my favorite fish store guy and showed him some pictures and he said Perseus had Ick (he got his name from surviving the awful things!) So he recommended "Ick Cure" active ingredients being formalin and malachite. It is a Apteronotus leptorhynchus .. I got it to eat from my hands now!